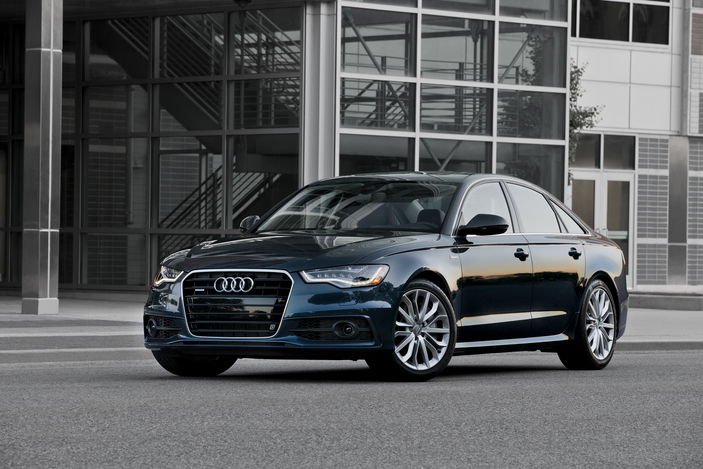 The new 2012 Audi A6 is just about everything a luxury sport sedan should be. It’s fast, it’s nimble, it’s stylish inside and out and it’s loaded with luxury amenities. Any quibbles I have are minor. First, Audi continues its string of well styled cars that offer character and identity. When you see an A6, you know it’s an Audi, with its large grille opening and stylish LED headlamps in front and its slim lights and trim rear styling. It looks strong, yet elegant, and unlike most of its German competitors, it delivers an equally stylish, not staid and primarily black interior. Audi calls its interior a wraparound skyline design. The “aviator blue metallic” ($475 option) test car featured a dark brown dash and medium brown leather seats with wood trim on the dash and doors with satin metal trim. This A6 also had a brown leather steering wheel and shifter, and mid-dash a pop-up navigation/radio screen that could be folded away electronically. Certainly the styling gets the luxury buyer to look, but Audi promises performance, especially at the top of the A6 line, which the test car was. This was the A6 3.0 TFSI quattro, which means it has all-wheel drive, and the biggest engine available in the A6. A base model is front-wheel drive and carries a fine 2.0-liter I4 that’s turbocharged and generates 210 horsepower. This model boasts a 3.0-liter supercharged V6 that deliver a healthy 310 hp while coupling it with an 8-speed automatic with manual Tiptronic mode. Acceleration is super, really pushing you back in the seat if you tromp the gas pedal. Audi lists it at 5.3 seconds from 0-60 mph. But the A6’s 8-speed automatic shifts seamlessly and feels perfectly blended with the power. You never feel the engine is working too hard and while you feel the power, you don’t get an intrusive growl or roar inside the cockpit. A recently driven performance-oriented Infiniti M56 certainly growled aggressively during acceleration. Audi’s quattro system does a nice job of keeping all the wheels working for maximum acceleration and traction too. I had a few wet days to try it out, but no snow to slicken the streets. Handling is sporty and precise too, giving the driver a confidence boost. Put the car hard into a sharp corner and it sticks well, the rear precisely following the nose’s lead. I felt no body lean and while the Audi isn’t light at 4,045 lbs., but it is 78 lbs. lighter than the previous A6 due to more aluminum used in the body panels. The A6 feels noticeably lighter than the M56. Both cars ride on wheelbases of 114+ inches, so are good sized cars. That normally smoothes the ride out considerably, and did in the Infiniti. But the Audi’s Sport package includes 19-inch summer performance tires and also adds a sport-tuned suspension. That increased the jiggle inside. You feel big bumps the most, while little chattery ones are not such a problem. Braking from the big 14-inch front and 13-inch rear vented disc brakes bring the car to a commanding stop. Stability control is standard. The A6 interior is stellar in styling. I really liked the “skyline” interior, both its look and its comfort. The leather seats and dash I described earlier look and feel rich. The seats are well contoured and supportive, plus feature two memory settings for the driver’s seat and three heat and cool settings. The power controls are easy to use and I quickly found a good driving position. The dash is attractive with white on black gauges and I loved the pop-up navigation, radio screen, which is large and easy to see. You can power it down whenever you want too, just as in several Cadillac models. My only interior concern really is the mix of buttons and knobs that are less than intuitive to work, especially the center knob that adjusts much of the navigation and radio system, plus many car’s systems settings. I encourage drivers to make all such adjustments before actually putting the car in gear. This requires your full attention. That said, the Google Earth feature of this navigation system is incredible. Seeing a real world view of the streets, buildings and alleys is so much easier to understand where you are going or want to turn. Plus you can adjust it down to as close up as 30 yards. Wonderful! This from a guy who usually doesn’t even care if he has a nav system. You also can adjust the system to look for gas stations and other travel and weather information. There’s more too, including the rear view back –up camera that displays on the nav screen, plus side assist, a blind-spot warning system, which adds $500, but is well worth it. 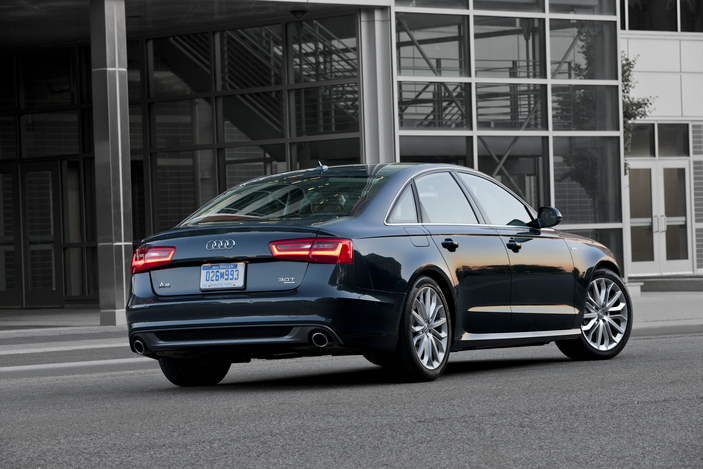 Audi also adds adaptive cruise control. Note that the back-up system beeps incessantly, so is annoying in parking lots when there are cars on both sides of you. The system beeps until you’re clear of those parked cars. The Prestige package, which adds $6,880 (Ouch!) to the tested A6’s base price of $49,900, includes a fancy 14-speaker Bose surround sound system with HD, plus 4-zone automatic climate controls and the seat ventilation system. It further upgrades the tire and wheel package to 18 inches and adds adaptive headlights, ambient lighting inside and a bigger monitor, plus multi-media touch interface with the navigation system. After the $875 delivery fee the test car settled at $60,130, a reasonable luxury sedan price and considerably less pricey than last week’s Infiniti. Yet the Audi primarily targets the BMW 5 Series and Mercedes-Benz E350. Gas mileage is slightly better than you might expect, rated at 19 mpg city and 28 highway, while drinking premium gas. I managed 19.9 mpg in about 60% city driving. That was about 2 mpg better than last week’s Infiniti with all-wheel drive. 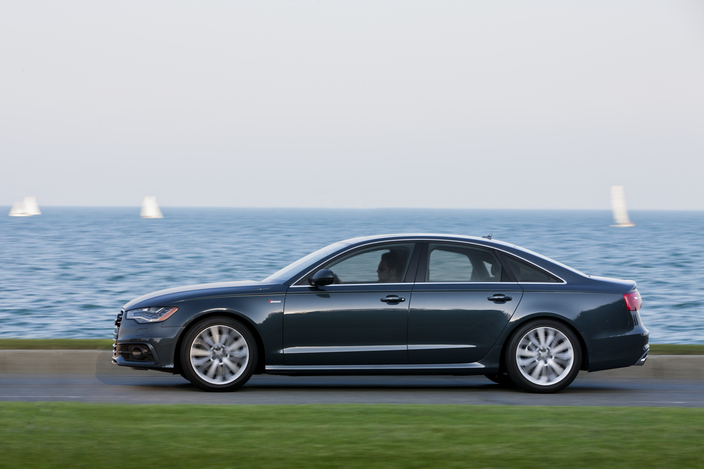 The A6 remains a practical family sedan too, with good head and legroom front and rear for four to five adults. Trunk space is a solid 14.1 cubic feet, and the rear seat splits and will fold down for more cargo room, not all luxury makes offer that. There also is a pass-through, commonly praised for use if you are packing skis. There are two cup holders in the console and radio channel and volume controls and navigation buttons on the steering wheel hub. Overhead is a sunroof and sturdy visors, although they do not slide. While I’d change a few minor things (add a winter package with heated steering wheel), from a driving and styling standpoint, the A6 is one of the most attractive mid-size luxury sport sedans. Hits: Good power, great handling and braking, plus the quattro AWD system. Handsome sedan with great looking interior, three-speed heated and cooled seats, blind-spot warning system and navigation with Google Earth feature. Misses: Less than intuitive mix of buttons and knobs on the dash, especially the navigation/telephone/radio mix. Ride is sporty, but could be too stiff for many, especially in areas with crumbling roads. Sadly it drinks premium gas. Previous Post2012 Infiniti M56XNext PostTwo Extremes! !